Bone soup made in a bronze tripod 2,400 years ago was discovered in an ancient tomb in Xi'an, capital of Northwest China's Shaanxi province, the Provincial Archaeological Institute announced on Saturday. 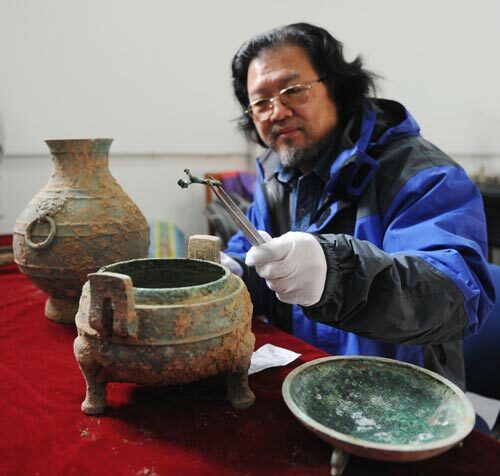 The institute said its archaeologists discovered the bronze vessel on Nov 25 when cleaning a Warring States Period (475-221 BC) tomb for the Xi'an Xianyang International Airport's second construction phase. "It's the first time Chinese archaeologists have unearthed such a container with bone soup still inside," archaeologist and head of the tomb's excavation team Liu Daiyun said. He said three ancient vessels were found. One was a tripod containing bones soaked in liquid. Another was a bronze pot containing odorless liquid believed to be ancient wine. The third was a rotten lacquer-ware vessel. Archeologists lifted the bronze tripod's lid and discovered it was half full of liquid and animal bones. Verdigris had turned the soup and bones a murky green. Liu said the three-legged vessel is 20 centimeters high and 24.5 cm in diameter. The bronze pot is 35.2 cm high with a 22.5 -cm abdominal diameter and a 14.2-cm base diameter. The relics were sent to the institute's laboratory for preservation immediately after they were unearthed. Archeologists will examine the vessels' contents to determine to which animals the bones belonged and to confirm the composition of the wine-like liquid in the bronze container. The institute said archaeologists also found a similar tripod, pot and lacquer-ware container in another adjacent tomb. But the vessels were broken and contained little liquid. "We discovered the left ribs of a cow next to the broken containers," Liu said. Archaeological experts said the styles of the graves and artifacts suggest the tombs were constructed by the Qin Kingdom during the Warring States Period. Similar nearby tombs and another cluster about 300 meters away from a Qin king's mausoleum suggest the occupant of the tomb with the soup was a high-ranking official or the king's relative. Further analysis will detail the soup's contents and shed new light on ancient eating habits, Liu said.